My name is Sheila Doherty and my friends say that I am loquacious to a fault. They mean that I talk too much. And I guess they have a point. I can be overly forthcoming at times. They would have been impressed by my entry to the United States. It was perfunctory and prosaic. There was no embellishment on my part. Everyone is loquacious in New York. But no one there seems to find fault in that. In that respect at least, I felt normal. Nonetheless, I figured that the wrong side of passport control was neither the time nor the place to start making myself at home. When asked I stated simply that the purpose of my visit was tourism, which was the truth but not the whole truth, and I resisted the urge to elaborate. I stepped onto American soil without let or hindrance. Her Britannic Majesty would have been pleased. I considered myself a dark tourist of sorts. And it pained me not share this with the mirthless Border Protection Officer. But I exercised restraint. One person’s morbid fascination is another person’s moral turpitude and to be refused entry would have been a disaster. Dark tourism is also known as grief tourism or black-spot tourism. Sites of special sinister interest like Auschwitz or Alcatraz are the new holiday hot spots. There should be a Loathsome Planet guidebook. But death, grief, and tragedy are not my bag. I was a different kind of dark tourist. I wasn’t interested in places where bad things have happened to other people. I was interested in places where bad things might happen to me. To be precise I went to New York because I was interested in places where I was convinced that bad things would happen to me. I have spent most of my life as an acrophobic you see. I’m afraid of heights. I don’t remember a time when I wasn’t. I do know that it got worse over time. It went from being a thing, to an issue, to a problem. It started out as apprehensiveness. But it became a destructive paranoid obsession. Heights didn’t have to be high to be fearsome. Changing a light bulb was a challenge. Mounting a stepladder could trigger dizziness, nausea or even a full-blown panic attack. I would plan my journeys to avoid driving over bridges. It even took the fun out of holiday planning. I would get all anxious if I thought I might be allocated a room with a balcony on a high floor of a hotel. It got to the point where I couldn’t hide it. My friends were sympathetic for a while. But their patience ran out when it became obvious that I lacked the gumption to do anything about it. They stopped making allowances. And, because there are no grey areas when it comes to a phobia, we more fell apart than drifted. Then fate intervened. I had an epiphany. An epiphany from a bible no less. Not any old bible, mind you. Not the bible. The Good Book may be an obvious source of epiphany for some, but it is an unlikely source for me. The bible in question was given to me by my Godfather and the epiphany happened by chance. One day, on a whim, I picked the bible off the bookshelf to thumb nostalgically through a few delicate pages. It fell open at a picture of a serene looking Jesus surrounded by children. The legend underneath was a quote from Matthew, Chapter 19, verse 14. I was struck by the incongruity of the word suffer. Why would Jesus want children to suffer? I took down a dictionary and discovered to my surprise that the archaic definition of suffer is to tolerate or allow. Allow little children, and forbid them not, to come unto me. To suffer is to tolerate or allow! I had allowed this fear of heights to define me. I had tolerated its debilitating effects. And in that moment I resolved, in the biblical sense, to suffer no more. Hark at me! My trip to New York would be a form of self-administered exposure therapy. Skyscrapers would be my medicine, one a day for three days before meals, and I was determined to complete the course. Determined is an easy thing to say, but it’s a less easy thing to be. Could I walk the walk? Well, on my first day, the walk to be walked was seven blocks of 5th Avenue from 42nd Street to The Rockefeller Centre – “The Rock”. Most people soon forget to look up in Manhattan. Even a tourist is quick to take for granted just how blessedly high and mighty and vertical and vertiginous everything is. Not me. It was a beautiful day. The sky was clear and cloudless. It should have lifted my spirits, but all I perceived was an ominous expanse of 9/11 blue. I had walked two blocks with my neck craned and my throat constricting. At close quarters the scale was bewildering. It was staggering. I was staggering. The buildings appeared to sway and I felt myself swaying with them. My legs were giving way and so was my resolve. I forced myself to look down in an effort to regain my balance. In that same moment a woman screamed and kicked a rat into the road. It was mesmerising. A crowd quickly gathered, full of morbid curiosity. We had effectively ruled out retreat to the sidewalk, but I figured that a New York rat would be an apex survivor, in the top percentile for street wisdom and cunning. I expected it to improvise an escape across four lanes of unyielding traffic. In its terror it hunkered down, made itself as small as it could and hoped for the best, or maybe just accepted the worst. Rodent fatalism! It was a most un-American tableau. Loser vermin. The sewer rat that choked. My heart went out to the rat. It was a metaphor for the old me, the old Sheila that had spent too much of her life paralysed by fear. I ran a mental checklist of relevant phobias. I couldn’t help myself. Musophobia – a fear of mice or rats. Agoraphobia – a fear of open spaces. Agyrophobia – a fear of crossing the road. The air was thick with fears. It was a visceral sensation. So thick you could cut it with a knife. Aichmophobia – the morbid fear of sharp things, including knives. I could feel my anxiety beginning to run away with itself. I was heading for meltdown. So I recited my New York, New York exposure therapy mantra. It was pretty thin as coping strategies go but panickers can’t be choosers, and that last line doesn’t scan. The two syllables of my name mess with the melody. Normally that would mess with my obsessively precise head. But just then it gave Sheila the pedant the ammunition she needed to distract Sheila the phobic. After several repetitions I felt the vertigo retreat and my resolve return. I picked my way to the back of the crowd and slipped sideways along marble and glass to a point where I could move freely once more. I didn’t look back. I couldn’t bear to see it. But I couldn’t help hearing it. Pop went the weasel-like rodent, followed by a mix of excited cheers and disgusted groans from the mob. Ugh! At least my panic had subsided, but I was shaken and fragile and there were still five blocks between this hard place and The Rock. I improvised a distraction, a variation on my mantra. I walked to the catchy refrain of New York, New York – ba ba bah ba-da, ba ba bah ba-da. I matched my steps to the beat, two normal, one long, two short. And I negotiated the remaining five blocks of 5th Avenue five syncopated steps at a time. The next time I looked up it was to contemplate The Rockefeller Centre, although it was more a case of it confronting me than me contemplating it. Seventy floors is a lot to contemplate for someone who struggles with seven steps on a ladder. Could I really make it here? I thought about the rat. It had suffered in the very sense that I had resolved not to. Was that my fate too? No! The rat had given its life so that I might be saved, so that I might have a life again. I chided myself for this mildly blasphemous train of thought, but this second epiphany was suddenly more powerful and more spiritual than the first. New Sheila stepped into the lobby. And, one escape-velocity elevator ride later, New Sheila stepped out onto the viewing platform at The Top Of The Rock and took in the breathtaking view of downtown Manhattan. 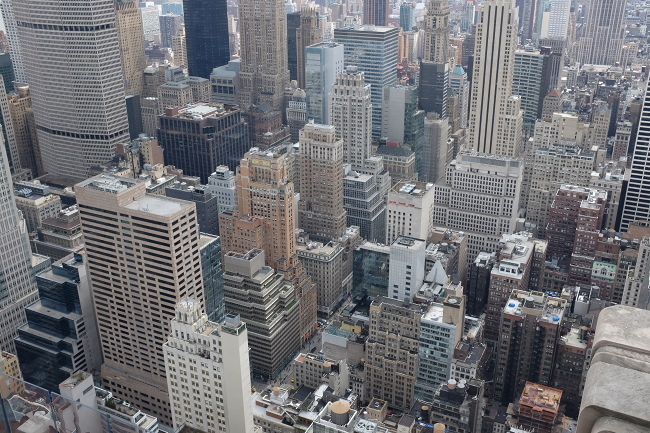 I stepped up to the thick glass barrier and looked down onto 5th Avenue. The people looked like ants.